Thanks to recent excavations by French archaeologists (Corinne Sanchez and others) the main port of ancient Narbo is now believed to be located at Le Castelou. This location is inside a series of coastal lakes that were more widely open to the sea in ancient times. The dominant NW wind direction in this area makes sailing difficult. The port was located at the ancient outlet of the Aude river and this proved to be another problem, as sedimentation had to be kept outside the port that was therefore built as a canal that probably had to be extended periodically. Let’s first try to understand natural phenomena related to coastal hydraulics and to river hydraulics, before having a closer look at the wind climate and to related sailing routes. Littoral drift is due to oblique wave incidence on the coastline. 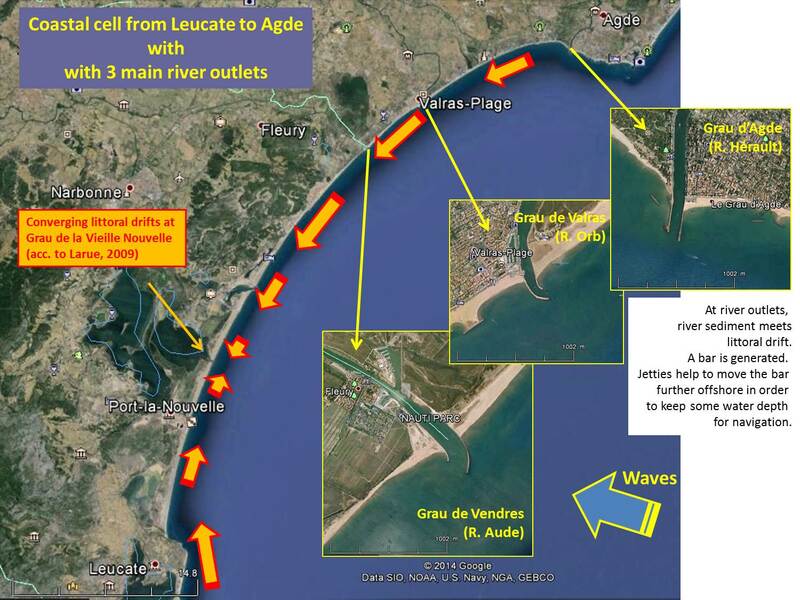 Wave incidence induces a littoral drift towards SW between Agde and Gruissan and conversely, a littoral drift towards NE is induced between Leucate and Port La Nouvelle. At places where both littoral drifts converge (at Plage and at Grau de la Vieille Nouvelle), the mean wave incidence must be nil. Fluvial sediment transport is generated mainly during river floods, i.e. rather unsteady: one or several hundreds of thousand m3 may be brought in in a few days, while littoral drift, which is more steady, does not exceed a few tens of thousands m3 per year. This means that most of the river sediment is carried to sea: that is the finer fraction of sediment brought in by the river. The coarser fraction of river sediment (i.e. sand) settles near the river outlet where the flow velocity is reducing. This sediment gathers as a “bar” located at the place where river and marine currents meet and which is under influence of both, depending on their relative strength. By building jetties, higher flow velocities are maintained and the bar is pushed offshore, where the water depth is larger, yielding more draught for shipping. However, littoral drift is interrupted by the jetties, inducing accretion on one side and erosion of the same volume on the other side of the outlet. This problem is like that of harbour breakwaters, even without any river outlet. This problem is still unresolved as mechanical transfer of sediment aiming at restoring the interrupted littoral drift is usually too expensive. Sky water runs down our mountains and flows into our plains. The order of magnitude of the Aude river discharge ranges between 10 and 100 m3/s for an average year, but it can reach several thousands of m3/s during exceptional floods with a return period of around one century (that is as much as the normal Rhône river discharge!). River beds are covered with fine and coarse sediment. These sediments are moved by water flows: it is usually considered that the sediment discharge is proportional to the water discharge. Hence, a flood will temporarily increase the sediment discharge by eroding the river bed. The order of magnitude of the sediment discharge of the Aude river was formerly in the millions of m3/year, but modern works reduced this by a factor 10 according to Ifremer. Similarly, if a structure locally increases the flow velocity, erosion will occur to satisfy the locally increased transport capacity of the flow. 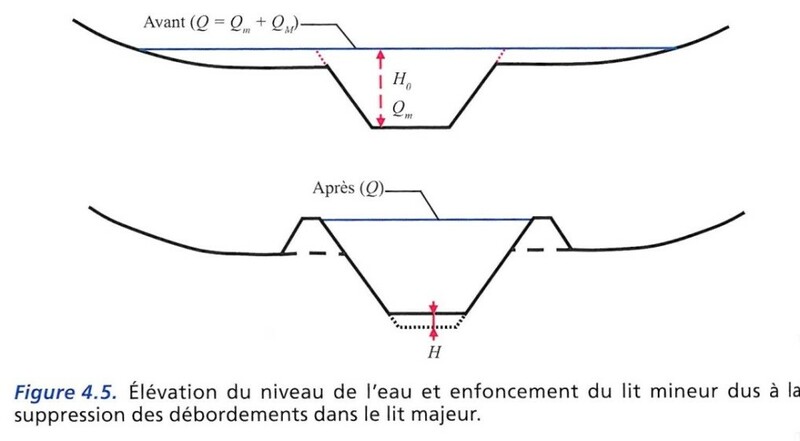 As an example, longitudinal dikes (called ‘levees’) aiming at containing the flow, induce a flow acceleration and thus river bed erosion (see picture below from G. Degoutte’s book). Rising of water level and sinking of river bed level due to stopped lateral overflow on floodplains. It is therefore possible to determine the width of a canal in order to keep a certain water depth according to the sediment grain size … if one remembers that beginning of movement of sand with 0.5 to 1 mm diameter is around 0.5 m/s, on 1 to 5 m water depth. 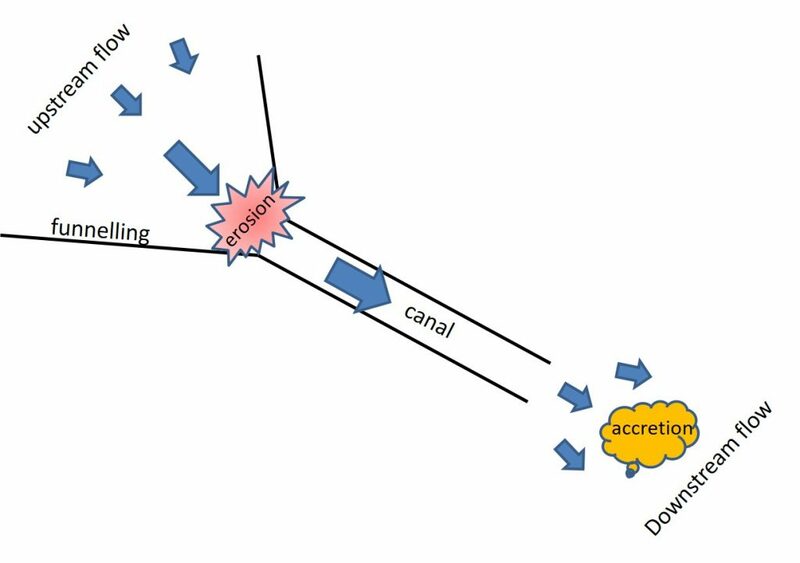 Sediment transport in a canal showing erosion at the intake upstream, and accretion at the outlet downstream. The upstream flow must be guided towards the canal intake, including during floods, and this may require quite extensive funnelling guide walls (called wing-walls) to avoid water flows wandering around during floods. Accretion must be anticipated at the downstream outlet of the canal because of the local decrease of flow velocity. The outlet must therefore be located at a water depth allowing some sedimentation before navigation is hampered. Once the minimum water depth for navigation is reached, the outlet must be dredged … or the canal length must be extended! Obviously, canal extension cannot be indefinite as hydraulic resistance increases with canal length which means that the water level increases at the upstream end of it and eventually the river flows around the wing-walls into the flood plains. In other words, the river searches other ways that are more ‘open’ … This seems to have been the case in the 14thc. when the Aude river moved to its present estuary North of the Massif de la Clape. 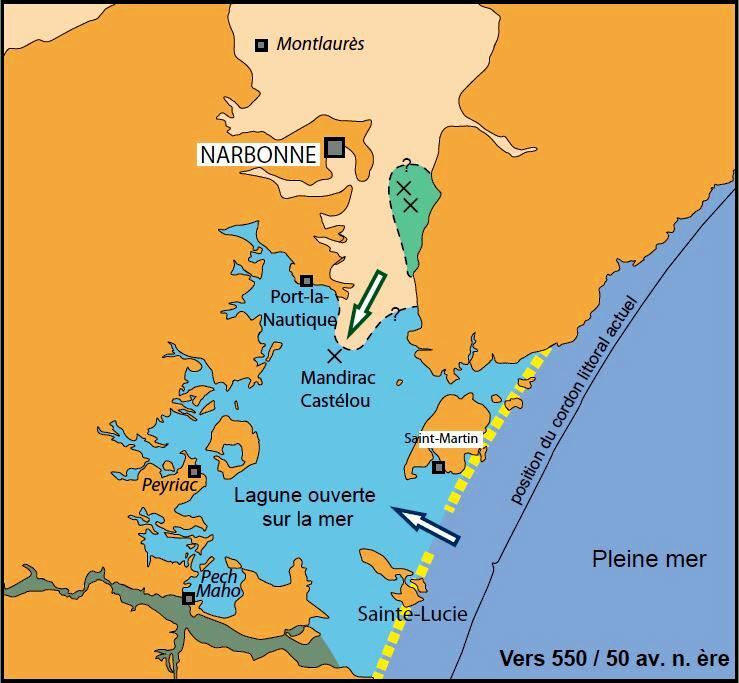 At the beginning of Christianity, before the Etang de Sigean silted up, the Narbo bay could be entered between the isles of Sainte Lucie and Saint Martin, close to the present Grau de la Vieille Nouvelle (see Faïsse & Salel, 2014). Wind statistics at Beziers airport (2001-2011). These statistics (©fr.windfinder.com) show wind-direction roses (yearly averages). Monthly averages are also given together with probabilities of wind larger than 4 Beaufort (‘Moderate breeze’ of 10-15 knots) which is quite sportive for an ancient ship sailing at close reach. Beziers airport provides stats over 10 years in an open area. Wind statistics at Gruissan (2009-2011). Gruissan’s stats are from an area more protected from NW winds because of the local landscape. Let’s conclude that winds on the Etang de Sigean and the Etang de Bages are mostly NW and larger than 4 Beaufort during 30 to 40% of time. At Gruissan, winds are mostly westerlies larger than 4 Beaufort only 5 to 15% of time. Sailing option from the sea to the port of Narbo. In order not to be facing the wind, sailing ships have to tack reaching an angle with the wind direction of not less than around 60° (see more on this in ‘Ancient Ships‘) as shown on the picture above. In front of the hill of Bages ships made a starboard turn towards Le Castelou where we believe the main port of Narbo was located on the ancient Aude river estuary. 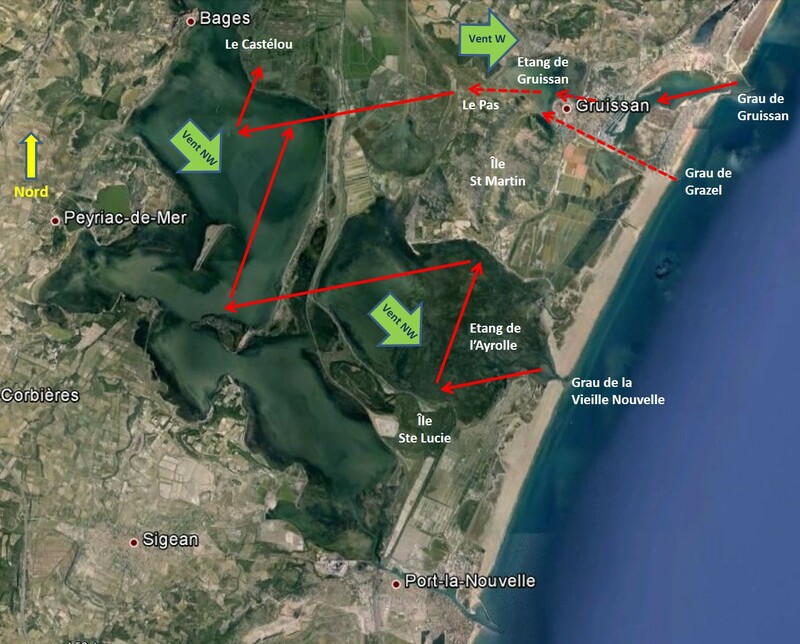 Access was probably also possible through the Grau de Gruissan and/or the Grau de Grazel, ships sailed on the the Etang de Gruissan at the toe of the Gruissan village on top of its hill. Sailing North or South of the Gruissan village, they had to cross two narrows with a minimum width of 200 to 250 m between the hills. Passing these narrows was difficult with head winds from West to NW and this area probably required help of land-based hauling. Sailing this route was obviously more easy with rather infrequent easterlies. CAVERO, J., 2014, « L’évolution des étangs narbonnais », éd. Parc Naturel Régional de la Narbonnaise en Méditerranée. FAÏSSE, C & SALEL, T., 2014, « Comprendre les dynamiques environnementales passées : l’apport des archives sédimentaires », éd. Parc Naturel Régional de la Narbonnaise en Méditerranée. FALGUERA, F., 2000, « Narbonne : cadre naturel et ports à l’époque romaine », éd. Méditerranée, Tome 94. LARUE, JP. et al. 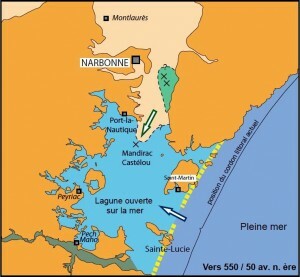 « Un littoral sableux en progradation : le lido entre Leucate et Port-la-Nouvelle », Physio-Géo, Volume 3, 2009. SOGREAH, « Catalogue sédimentologique des côtes françaises – Méditerranée », éd. Eyrolles, N° 52, 1984. CLAUDET, R. « Les crues des 12, 13 et 14 novembre 1999 dans l’Aude, l’Hérault, les Pyrénées-Orientales et le Tarn. Analyse hydrologique de l’événement », éd. Géocarrefour, vol 75, 3/2000.